ChurchKey's tot sundae ($15) starts with your basic tots, but these fried potato bites are rolled in cinnamon and served with nutella ice cream, giving a sweet twist to this normally savory food. Tater tots are one of those quintessential college foods. They are both crispy and greasy but remain light, so you can pack them away without knowing you’re full. With Tonic Restaurant, known for their tater tots, right on campus, students are no stranger to these fried potato bites. But mixing tater tots with sweeter items is a rarity here in the District. ChurchKey, located in Logan Circle, is aiming to change that. ChurchKey offers a whole range of ways to enjoy tater tots. They have their plain homemade tater tots ($8), tater tots served with poutine ($12) and tater tots served with a fried egg, mozzarella, chilli and bacon ($12). But the most unique and popular dish is their tater tot ice cream sundae. ChurchKey’s tot sundae ($15) starts with your basic tots, but these potato delights are rolled in cinnamon and sugar giving a sweet twist to this normally savory food. Then Nutella ice cream is scooped onto the plate to add both a creaminess and chocolate flavor to the dish. Whipped cream is added to the mix next to top it off like any other sundae. Surprisingly, all of the textures and flavors of the ice cream, whipped cream and tater tots complement each other well. The mixing of greasy food with something sweet in this case works just as well as peanut butter and jelly. 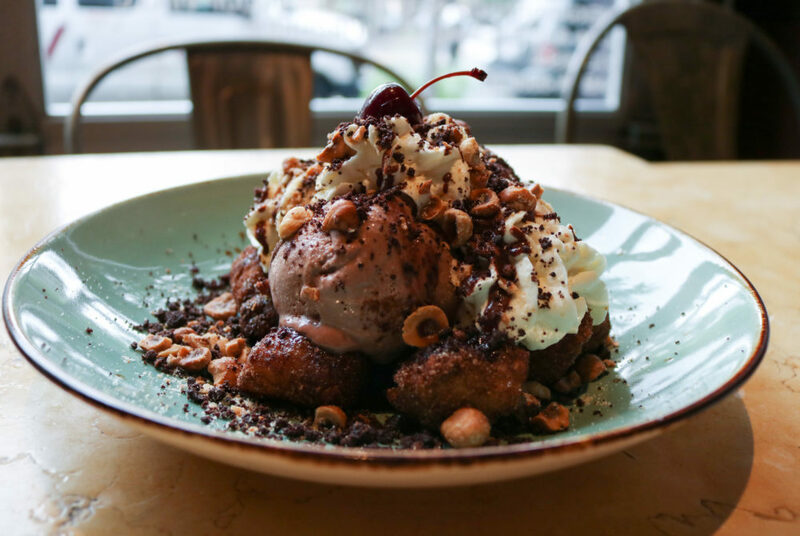 The dish is topped with candied hazelnuts, to give the plate a bit of crunch, and juicy Maraschino cherries finish off this elaborate sundae. This article appeared in the September 7, 2017 issue of the Hatchet.